UK - For the first time this year, regular audio supplier to the Barclaycard Mercury Prize, Plus 4 Audio made the move to a fully DiGiCo system, with the UK-manufacturer’s consoles seen at each of the awards show’s mix positions. Held at iconic North London venue The Roundhouse, hosted by Lauren Laverne and won by James Blake for his album Overgrown, the Barclaycard Mercury Prize is judged by a panel of music experts, so supplying audio for the live event holds a large degree of gravitas. "We’ve been working on the Mercury Prize event for the past 10 years," says Plus 4’s operations manager for the event, Mark Ballard. "It’s great to work on because of its high profile in the industry. "The move to DiGiCo for the event started when we introduced the consoles into the Barclaycard Mercury Prize Sessions at The Hospital Club in Covent Garden. "We had used SD7s at FOH for last year’s awards, with SD8s elsewhere, and this year we felt the time was right to make the shift to an entirely DiGiCo console setup. We also made the decision to have SD5s as our monitor boards, which was another first. It was the right decision as everything about the desk suits these shows." 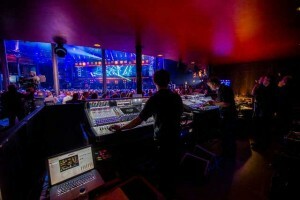 With 10 acts fully live and playing only one song each, even the deployment of an A/B system, with Nick Cook and Lewis Warehan looking after FOH positions, Martin Dineley and Rod Clarkson at monitors for Plus 4 and Simon Wall from the Hospital Club engineering a separate broadcast mix, meant incredibly fast turnarounds between acts. But this was where the DiGiCos came into their own. "Using a DiGiCo desk allows you to set up it up for each band’s engineer and know it’s exactly how they want it. Even if they’ve never used DiGiCo before, it’s easy for them and they come away with a good experience," says Mark. "Some of the bands sent us session files that we imported and then changed to match our patch system. For most of them, we created a session based around their channel list, but with our generic system patching them on stage. "In each case we tried to make the engineer’s session individual to them and the layout of the DiGiCo consoles makes that really easy; rather than being a generic board, we were able to customize them for each act. Another advantage is that the engineers don’t have to go looking for things, as every input and output channel is right there in front of them. It’s pretty difficult to do that with any other desk." Reports from the visiting engineers were very favourable and everyone was happy with the sound. "That’s quite an achievement," smiles Mark. "The Roundhouse can be challenging to get good sound in, but we were very very happy with the end audio result." The shift to DiGiCo for the Mercury Prize is indicative of Plus 4’s current equipment inventory - until five years ago, their stock of mixing console was sparsely populated by the company’s boards. "Now, DiGiCo is the predominant brand of console in our warehouse," smiles Mark. "In fact, we’re selling off our other consoles to buy more," says Mark. "We’ve made a pretty sizeable investment and that shows our faith in both the company and the product." With the success of the system at The Roundhouse, it is a faith they know is well placed.